뉴올리언스, 미국의 마담 이사벨 하우스 인 뉴 올리언스 | 호스텔월드에서 예약하세요. The house is tastefully ornamented and furnished, staying faithful to the architectural characteristics typical of old New Orleans houses in this area. As we are proud of every single detail that makes this house special, we encourage you to enjoy every part of it as well and to feel at home for the duration of your stay. Once you venture out the house, a vibrant neighborhood welcomes you. 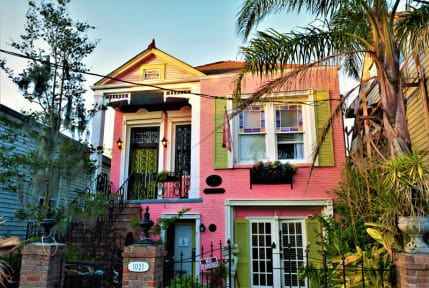 Delicious restaurants and local bars share the streets with Creole cottages and shotgun houses. Though set in a quiet area, thriving nightlife is easily accessible from Madame Isabelle’s House: Frenchmen Street is only five minutes away by foot, Bourbon Street is within ten minutes walking distance, and Canal Street, which connects you to Mid-City and Uptown, fifteen minutes away by foot. If you would like to explore more than the downtown area without heading all the way to Canal Street, there is a bus stop conveniently located at the corner of the street that can transport you to any of the city’s many renowned tourist destinations. Dormitory rooms as well as private rooms are available. There are two and three person private rooms in the house. Almost all of our private rooms are equipped with a cable TV, a refrigerator, and a private bathroom. All beds are equipped with new, 8-inch mattresses and brand-new linens; however, you may not want to stay in your room long because the hidden courtyard garden awaits you, replete with an outdoor deck and a Jacuzzi hot tub. Check in from 15:00 to 22:00. Please contact us beforehand to schedule a check-in time. Guests over 40 years old will be welcomed to stay in the private rooms but not be allowed to stay in a dorm room.